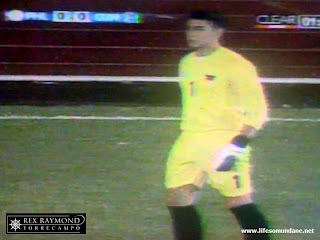 There was every danger, seeing as Guam is almost 50 notches below us in the FIFA rankings, that somebody would have to sneak in a PSP to give Neil Etheridge something to do whilst in the middle of an international friendly against the Philippines tonight at the Panaad Stadium in Bacolod. Indeed, after an initial charge deep into the Philippine half straight from the kickoff, Guam settled back to do what everyone more or less expected them to do. Defend in numbers, that is; and often petty fouling to give the match an annoying stop-go rhythm. Such desperate defending on the part of Guam was at times curiously painful to watch; and primarily because that was exactly how we looked playing against stronger teams not too long ago. On the other hand, there was also undeniable novelty value in watching a Philippine team play when losing did not even seem to be a distinct possibility. Still, of the spate of friendly internationals that the PFF had the utter good sense to schedule this month, this was probably when the Philippine team was the least convincing of the lot. 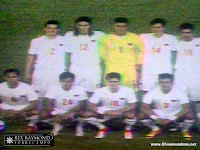 This was a powerful team that Michael Weiss sent out into the warm Bacolod night, mind! On the other hand, no less than Michel Platini, in the 1986 World Cup playing for Les Bleus against Canada, elaborated on the difficulty of raising one’s game playing against a decidedly inferior opponent. At the end of ninety minutes, one Guam player was briskly applauding the 3-nil scoreline even if the scoreboard showed that the Philippines had won it. Indeed, to have kept the Philippines to a measly three must have felt as good as a win. That Guam conceded three goals – and all in the first half at that – would have been all the reminder that they needed as to why they went to Bacolod in the first place. It was always clear that they were coming for the experience rather than the roasted chicken. 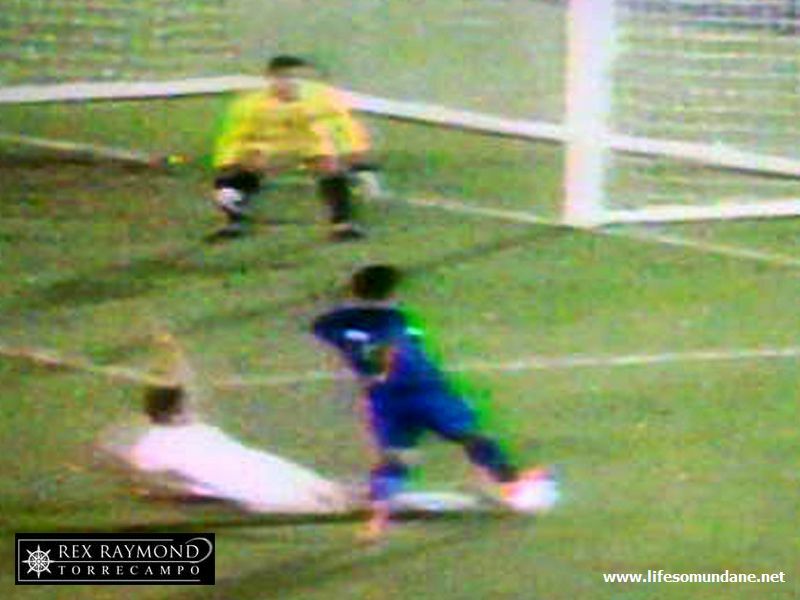 The expectable naïveté was evident in all three goals that the Philippines scored. First, in the 7th minute, Angel Guirado received the ball on the left flank with space to deliver a telling cross. He did; and as he did so a stiff gust of Panaad wind must have caught the ball to guide it over the badly-positioned goalkeeper and into goal. The Philippines were up by two just four minutes later. 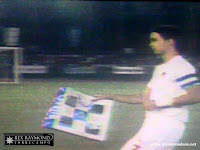 Carli de Murga was sent through after a neat interchange of passes between him, James Younghusband and young Marwin Angeles on the right flank. De Murga’s finish was exquisite; but for a goalkeeper to be beaten from such a narrow angle naturally raises questions about his positioning. To their credit, Guam did not just lie down and die; and indeed all indications after the second goal pointed at the floodgates opening. On the contrary, however, Guam without looking unduly threatening decided to offer Etheridge better entertainment than a PSP midway through the first half by actually daring to push forward more. Not that they possessed anything upfront to trouble the somewhat out-of-sorts Jason Sabio or the groggy Robert Gier, whose head was bloodied by a clash of heads earlier in the game. These nasty head wounds tend to be frightening because of the blood; but they really are quite innocuous. 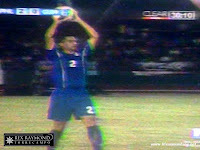 When a third goal did arrive, as was only appropriate, it came for the Philippines off the head of Angel Guirado. Dennis Cagara floated in a delightful freekick and Guam’s defending of the dead-ball situation was Sunday league quality; and that may even be insulting to Sunday league players. There was every reason to expect the floodgates to finally open in the second half; but instead Guam not only defended tenaciously, they even had the gall to at times string passes together in midfield. 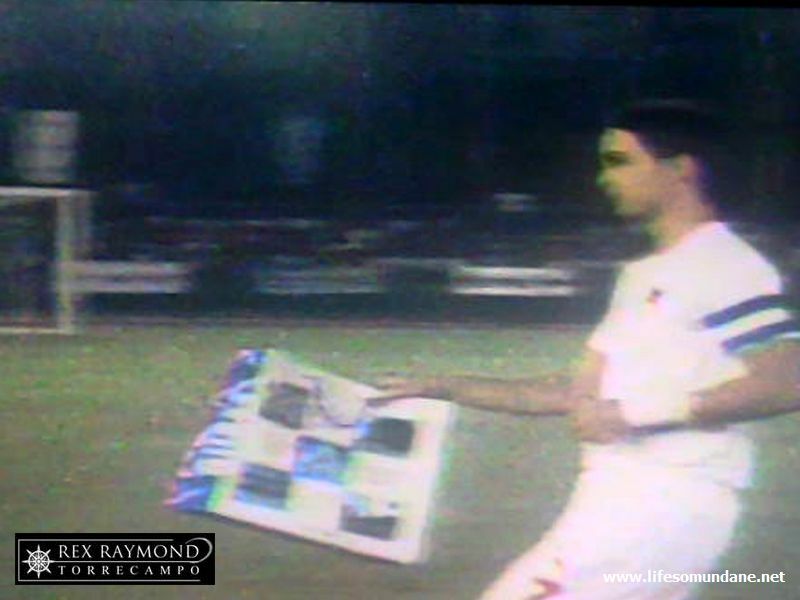 It was apparent for the entirety of the match that Guam had done their assignment on Phil Younghusband, who was shackled almost till the endgame. That meant that it was Dennis Wolf who was getting all the looks at goal; except that he seemed to have left his shooting boots back at the hotel. That the Philippines could not add to the first half score was probably disappointing; but it is a sign of the progress that has been made by the country that a 3-nil victory over Guam can be viewed as something of a letdown. Although it was a strong team that started for the Philippines, it was not necessarily a balanced one. In the first half, in particular, the team at times was too narrow and would have benefited from the presence of a natural winger in the mold of Chieffy Caligdong, who was suspended. There was also an uncharacteristic over-eagerness to play the forward ball; probably because the midfield was crying for a recognized playmaker. Perhaps Anto Gonzales could have come in sooner to ensure that the ball saw more of the real estate than the impatient forward passes that Guam invariably and easily snuffed out. No disrespect to Guam, who defended resolutely; but it is against opponents like this that I would like to see us bring the ball down and knock it about with quick touch-passing played to feet. We saw glimpses of it tonight; but no more than this. Angel Guirado would probably have walked away with the Man-of-the-Match award after his brace; but while I applaud his goals, what I would like to see more from him is to be less elaborate and to finally realize that the simpler and quicker ball is always the more effective one. On a final note, either the ball was overly inflated or the ground was just too hard. The ball control by both teams was at times simply appalling.